The Top-100s are Coming. The Top-100s are Coming! Update 2/13/17: Folded Baseball America & Baseball Prospectus rankings into model. As the offseason slog slogs on sloggily the weary baseball fan may be able to grasp some sunshine with the release of various top-100 lists. So far I have seen top-100 prospect lists from MLB, Keith Law and Dan Szymborski’s ZiPS projections. Naturally, we fans want to know how our team compares to one another using somewhat different perspectives. To that end I have compiled each of these three lists, though because two of them are behind a paywall I do not think it would be right to share the list. Instead, I’ve gone further. I make it no secret how much I respect the quality of work in this study from the folks at The Point of Pittsburgh. The gist is that their research seeks to put ballpark estimates on the expected surplus of a prospect based on their ranking on the Baseball America top-100 list. Additionally, adjustments are made for whether the player is a hitter or pitcher, as each type of player faces different odds and future compensation. While we do not have what I would expect to be great work from Baseball America we do currently have these other three. Once other lists are publicly available then those can be folded in, but for now, let’s look at how the current lists rate these guys. 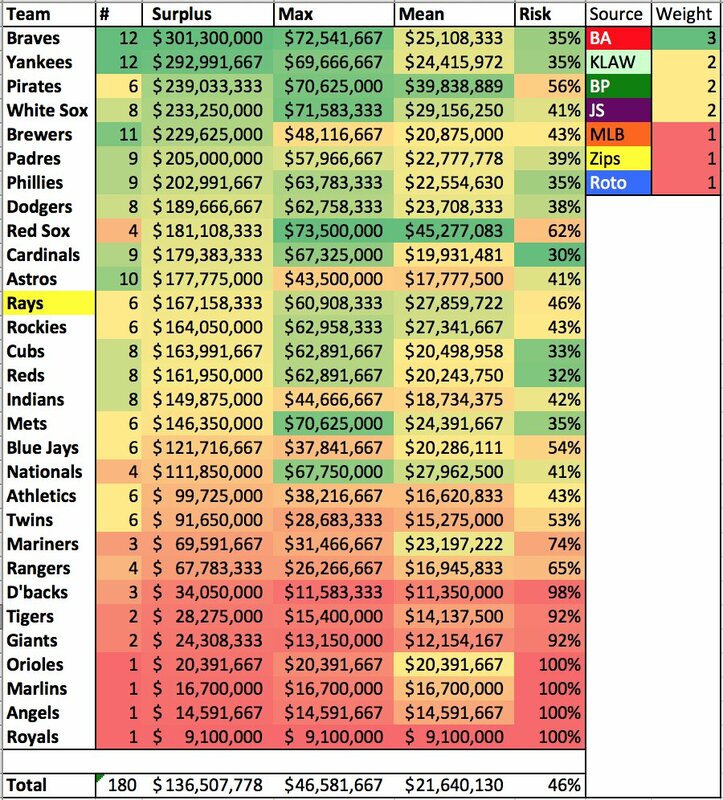 The Rays have a few well-defined tiers here. Adames is one of the best prospects in baseball with a very high level of expected surplus. The two righty pitchers slot in next as future mid-rotation guys that carry enough risk or expected plateau that they’re more good than great values. Lastly, come Bauers and Robertson who might pan out as useful players (according to the lists, personally I think they’re terrific), but you probably shouldn’t bank on it. It’s important to note here that these lists aren’t everything. They’re wrong often enough that only a fool would completely take them seriously. Averaging several lists together does help give a little more information, and the more that comes in will help them tell an even more accurate story. Stay posted as further updates come on this front. who are three top 100 prospects for the D Backs ? Also, why don’t you include John Sickels ?